Without regulation of hunting, attempts to save Macqueen's Bustard through releasing captive-bred birds are counter-productive and post a long-term risk to the birds' survival, according to new research led by the University of East Anglia (UEA). The findings show that the species is declining by more than 9 per cent each year, meaning the number of captive-bred bustards needed to be released annually – just to stabilise the amount of wild birds – would be one-and-a-half times larger than the wild population itself. The study, published in Biological Conservation, concluded that population stabilisation solely through captive breeding would require so many that, inevitably, the remaining wild birds would be compromised. Although such reintroduction schemes can help species from extinction, they also pose risks that can lead to a negative impact on the fitness of wild populations. As a result, sustainable hunting and conservation of the bustard needs to be implemented. The research shows that sustainable hunting is needed in order to save the wild population of Macqueen's Bustard (John Johnston). Paul Dolman, Professor of Conservation Ecology in UEA's School of Environmental Sciences, said: "While captive breeding can be a valuable conservation tool, over-reliance on it without tackling the unsustainable scale of hunting and trapping cannot save Macqueen's Bustard and may in itself become an additional threat. Developing a truly sustainable model of hunting requires international cooperation between falconers and the countries with the bird, to regulate hunting and trapping using sound biological evidence." 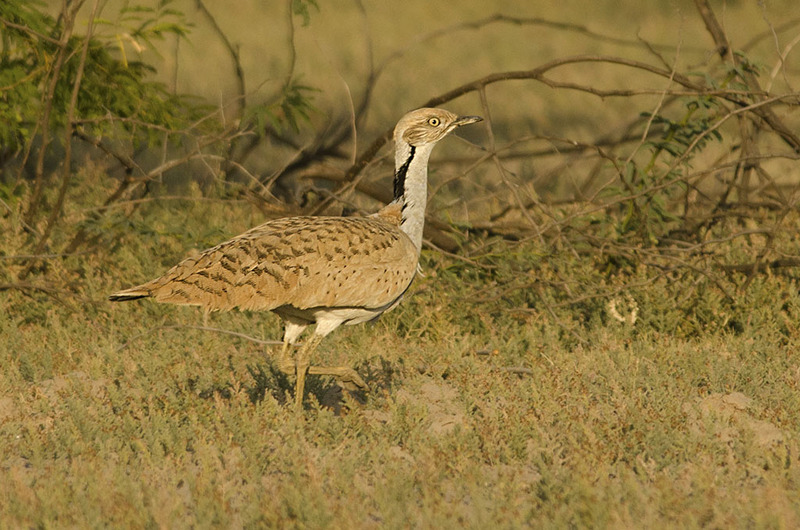 Macqueen's Bustard – also known as Asian Houbara – breeds in the Middle East and throughout Central Asia. The bird holds major cultural and political significance due to its association with Arab falconry. Since the 1960s the species has declined drastically and with safeguarding attempts thus far based around supporting falconry, conservation efforts have simply involved the release of increasing numbers of captive-bred birds. However, the recent study is part of a long-term collaboration between the Emirates Bird Breeding Centre for Conservation (EBBCC), BirdLife International and UEA, with the research aiming to develop a sustainable future for the wild populations while also preserving traditional Arab falconry. Data was collected over seven years of desert fieldwork in Uzbekistan, including via satellite-tagged wild and released birds. The researchers concluded that numbers are declining by more than 9 per cent each year, instigated by unsustainable levels of hunting and trapping on the wintering grounds in Afghanistan, Iran and Pakistan. To sustain the wild population in Uzbekistan, 7,200 Macqueens Bustards would need to be released annually (commons.wikimedia.org). Captive-bred birds have a higher mortality rate than young wild individuals and to stabilise the population in the 14,300 km² study area, while compensating for a modest hunting quota, 7,200 bustards would need to be released every spring just to stop the population from decreasing. Aside from the aforementioned possible knock-on effects the wild birds would suffer, it would also be hugely expensive, thus reaffirming the need for regulated hunting. Professor Nigel Collar, Leventis Fellow at BirdLife International, honorary professor at UEA and chair of the IUCN Bustard Specialist Group, was a close collaborator in the study and said: "Bustards in Asia are disproportionately in trouble. The current reliance on captive-breeding diverts resources and attention away from other key conservation needs for the Asian Houbara, such as tackling illicit trade for falcon training, establishing safe havens along the flyways and reducing threats from power lines. A holistic, multi-faceted approach to houbara conservation is now absolutely essential."